When putting an internet-connected device with a microphone in it in your home there's always the risk that it could be constantly recording and sending your data to its manufacturer. 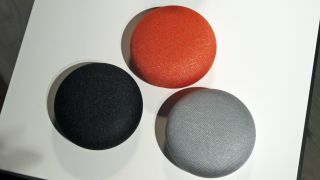 For some owners of review samples of the Google Home Mini, this worst case scenario came to pass as their devices were found to be constantly recording and sending the audio data to Google. After a journalist from Android Police (via: Engadget) received one of the devices from Google's recent launch event, he noticed that its lights were constantly flashing even when he wasn't speaking to it directly. The reason for this has to do with the touchpad that you can use to wake the device manually rather than saying 'OK Google'. On this particular device, this was malfunctioning, causing the device to constantly think the user wanted a command recorded. Since discovering the problem, Google has issued an update to correct the issue. This isn't the first time there have been privacy concerns surrounding a smart home speaker. Since the devices are always listening out for their 'wake phrase', there have been some concerns that the devices are constantly recording, and sending this voice data back to their manufacturers. These concerns came to a head last year when data from an Amazon Echo was requested as part of a murder investigation. This caused Amazon to issue a statement confirming that voice data was only sent back to the company after a wake word was heard. However, more recently a security expert demonstrated how a previous generation of the Echo device could be modified to allow a hacker to remotely harvest its data without the user's, or Amazon's, knowledge. The vulnerability has since been removed in the current generation of the device. This malfunction will do little to dampen these privacy concerns, although it's reassuring that it has affected a pre-release review sample and that Google would correct the issue so quickly. Thankfully, not every recipient of a review sample of the device was so unlucky. For a look at the competition, check out our guide to the best smart speakers, which will hopefully see some discounts this coming Black Friday.